All the useful information that you need to know before sending money with CurrencyFair! Best Exchange Rate or you Can Choose Your Own Rate. Can Transfer Money for Multiple Purposes. CurrencyFair is an Ireland based fintech startup with offices in Australia and the UK. Recently it has been named as one of Irish Tech News’ Top 20 Companies. It was launched in the year 2009, and in the past 9 years, over 8 billion Euros are exchanged by the customers using its services. CurrencyFair fee charge is approximately $4 or €3 for its money transferring services. It offers remittance services from the USA, Europe, Canada, Australia and New Zealand to 50+ countries. It has only one payout option, and that is the bank account. You can transfer the funds from it by associating the bank account, no matters if it is personal or business transfer. It does not have any maximum limit to transfer funds, and you can send the amount as much as you want to but have a minimum limit of $8. It has provided a support form, where customers can post their queries, and the support staff will connect with them within 24 hours. It does not provide any contact details so customers cannot connect them directly. It employs world-class security, so customers can stay worry free with their personal data. Overall, we rate CurrencyFair 9 out of 10. Pricing : How much does CurrencyFair cost? The rates offered by CurrencyFair are highly competitive. You can choose the rate offered by it or can set your own rates and wait to be matched with other customers exchanging the opposite currency. CurrencyFair has a fix transfer fee of €3 and on an average one needs to pay approximately 0.4% of amount exchanged. It charges 0.25% to 0.3% (depending on the currency exchanged) of the total amount when customers match each other. In case, when there is no customer matched, it makes a match for you by itself and charges approximately 0.4% to 0.6% of the amount, depending on the currency exchanged. So, overall one needs to pay in between 0.1% to 0.6% of the total amount with a fixed transfer fee. Although CurrencyFair regular transfer fees are the currency equivalent of €3, that if a new customer signs up they get 3 free transfers. You can also calculate the rates with CurrencyFair calculator which shows the live rates one will get for making the immediate transfer. These transfer services of CurrencyFair are not available in the US. So the residents here cannot use its facilities for making the online transfer. Transparency: Does CurrencyFair have any hidden fees? There is no hidden fee when you use the services of CurrencyFair money transfer. Once you choose the currency and country, it will provide you with the details of approximate fees. The further fee will get updated as you enter the amount and other details. The total amount you need to pay will be shown on the transaction page and not a single penny more. When it comes to transparency, CurrencyFair peer to peer transfer has not provided ant tracking transaction page. One needs to ask with the support team on their query page regarding the same. But you should note that CurrencyFair provides email services for transaction tracking. Transfer Speed: How long does it take to send money through CurrencyFair? CurrencyFair money transfer has a variable transaction speed depending on the currency and country. You can also check the CurrencyFair Process Time here. The company tries to send the money as fast as possible but it sometimes also depends on the banks through which the customer is sending funds. If customers need to send money quickest, they should transact in the morning, as most of the banks have a cut-off time in the afternoon. So the transfers done after the cut-off time will take place on the following day. Before commencing transfer, one should note that personal transfer takes approximately 1-2 days while business transfers take more time with up to 3-5 working days. There is a single pay-in option available in the company, and that is the bank account. Click here for CurrencyFair login and start your transactions now. Security : Is CurrencyFair Safe? The Central Bank of Ireland is regulating the company for its business in Ireland. The Australian Securities and Investments Commission (ASIC) regulates the business of CurrencyFair in Australia. It uses 256-bit encryption via SSL from VeriSign for providing a secure connection. It held all the customers’ accounts separately and increased security by Two-Factor Authentication. It will combine the password of your account with any of the things whose possession is only with you, for example, mobile phone. It will send a code on the mobile number whenever you try to login or send money. It also provides 6-digit CurrencyFair PIN which customers need to enter when they want to login or to start any transaction. We believe this security is equivalent to many banks and it deserves 10 out of 10 in this category. When it comes to customer satisfaction, then CurrencyFair limits to online assistance only, where you need to fill their contact form. They have 24/7 assistance as they have an office in Australia that handles queries when their Dublin office is closed. When we talk about the payment convenience, CurrencyFair doesn’t accept debit or credit card, and it takes funds from bank account only. So, those who hold crypto currencies, money market securities, etc., could not transfer money through CurrencyFair. Currently, the company accepts debit cards which are issued by the banks in the Republic of Ireland and in the name of an Irish resident. For user experience, we rate CurrencyFair 8 out of 10. We would have given higher score to CurrencyFair if customers have a clear knowledge of their transaction with it and review process. Coverage: How many Countries & Currencies does CurrencyFair support? Recently, it has launched its transfer services in Indian Rupee (INR), so, customers can send to India also now with CurrencyFair. It is also offering free transfer of INR. Inexpensive transfer for international students. Property owners who want to paid loans. Overseas workers who want to send money regularly to the family. Non-emergency transfers, which can take up to 7 working days. Business transfers, paying overseas salaries, receiving payments, etc. Besides all these transfer services, there are many areas in which CurrencyFair can grow. It has recently started providing its services from the US and one can send USD to 50+ countries. This will help it to become one of the major player in the money remittance industry. I used CurrencyFair to transfer AUD money in Australia to USD in the USA. It was very easy and quick, and much cheaper than using banks. I found the whole experience was excellent. I will only be using CurrencyFair from now on when I have to make money transfers overseas. All ways have found Currency Fair to be a couple of points better on there exchange rates than any other providers so far! I use Currencyfair about 10 times a year. It is a quick transfer, their support is great if you have questions, and the flat fee is fantastic. I'll continue to be a user long into the future if the service continues to be so great! Thanks CF! I've been using CurrencyFair for 5 years now, always with timely, accurate an no-problem performance on their side. Also with competitive exchange rates and with reasonable fees for transactions. What else one could demand and expect from an online currency exchange service? Strongly recommended. Good experience of multiple FX currency dealers. Over the last decade have made vast majority of my FX transactions via CurrencyFair: market competitore rates (in 10 years they have had the most attractive rates or - in some cases close to the same rates), with only SWIFT transaction fee. The end result is more FX money for your starting sum, and a robust user experience too. I've tried several similar services. This tops them all for value, reliability, and regions covered. Easy to use and the best possible exchange rates. Highly recommended! The shining light of currency exchange companies. 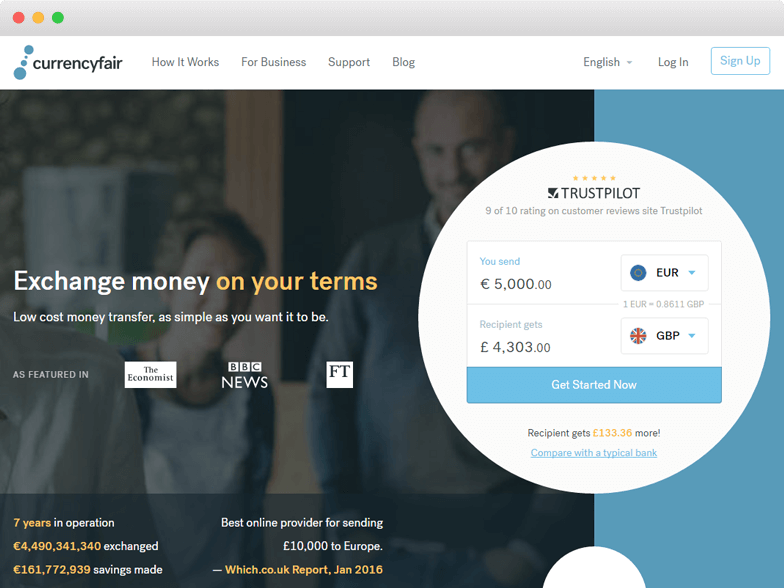 CurrencyFair has provided me with the very best overall currency exchange system I have ever used: their rates; their ability to hold my funds to allow me to exchange when it suits me; their Customer Service. Very cautious to start with in view of possibility for fraud when dealing with an unknown company, but having made several transactions I have no problems. Everything went absolutely smoothly and is by far superior to the service offered by banks. And less expensive. Quick, safe and efficient with good rates at low cost. Simple and easy to use. Quick service and minimal fees. Will not hesitate to use next time I need to transfer currency. Overpromised and underdelivered. Exceptionally poor communication. After researching who to use to transfer/exchange currencies between personal accounts, I settled on CurrencyFair due to the overwhelming number of positive reviews... They have overpromised and underdelivered, leaving me in a difficult position. This was not a small transfer I made, but I had made plans to be able to access this money in my foreign account when CurrencyFair said it would be ready. Now, ON the day the money was meant to arrive, CurrencyFair has told me it will arrive 4 days later than they initially said which is unacceptable. No email confirmation or message, there's just a small 'update section' on the website where my login is. I have now been left letting others down which has reflected poorly on me. Due to the fact that my money has already left my account and is no longer with me, all I can do is now wait... There is nobody I can speak to and they seem to actively hide any telephone numbers where you can speak to someone directly. Everything is done through their troubleshooting online with FAQ's. Had I been told this was going to happen beforehand - or if they could have at the very least! communicated through to me there's going to be a delay for whatever reason, I would not have used their services. Very disappointed and will not be using this company again. Go to the website of CurrencyFair and click on “Get Started Now” in the mid of home page. Select the type of account, either Personal or Business. If you have a personal account, you can also signup with your Facebook account. If you have a business account, enter the email and create a password. Provide all your personal and contact details. You need to prove your identity by submitting any of your legal documents. Your account is registered now. Enter the bank and personal details of the recipient. Enter the amount you want to send through CurrencyFair. It will provide you with a reference number through which you can track your transaction.